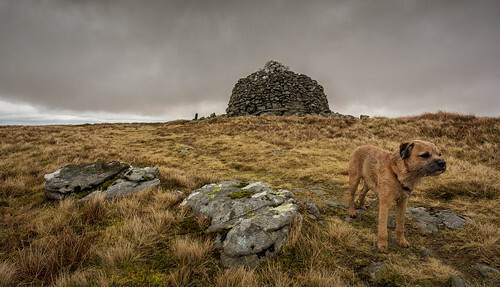 Monty looking heroic at the top of Drygarn Fawr in Mid Wales. Drygarn Fawr has got to be one of the bleakest places I know in Wales, especially on a day when there is a biting wind, the temperature is around zero and the cloud threatens to engulf the hilltop. It is hard work under snow and ice. This hill has two of the biggest cairns I know of, both of which were built by the workers who built the dams in the Elan Valley far below.